Let's talk about How to Throw a Curveball. To begin with Much has been said regarding the Pros and Cons of throwing a curveball at a young age. I personally warn against having kids attempt to throw a curve ball too soon, as I prefer to teach a Sinker instead, as it’s easier on the arm and it gives the pitcher the 3rd pitch he needs. A Fastball, Change-Up and Sinker is an excellent selection of pitches in which to choose from for maximum efficiency. However, since there are coaches who disagree with my philosophy, or kids who will try to throw a curveball no matter what their coach says … Let’s teach and learn the proper mechanics of throwing a Curveball. 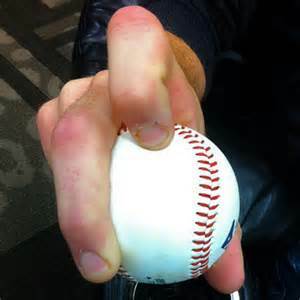 A normal curveball grip is not necessarily difficult and actually allows the pitcher a very good base for gripping and controlling the baseball in comparison to some other pitching grips. Keeping in mind the Top Spin which is critical to forcing the ball downward, will help in your learning the proper pitching mechanics required. A curveball, that Doesn’t curve … is usually hit a great distance. Begin your grip by positioning your Middle and Index together with your finger tips on the seams of the ball, where the seams are the farthest apart. Maintain a firm grip on the ball, especially with your Middle finger. **** Do Not let the ball touch or rest against the palm of your hand or else you’ll be restricted from creating maximum Top Spin, which results in Hanging Curveballs. We have already discussed the extreme importance of deceiving or fooling the hitter. A hitter expecting a fastball rarely has the time or ability to compensate keeping their weight or hands back in order to hit the curveball. In other words, be careful of how you obtain your pitching grip, as you don’t want to be fumbling or spinning the ball in your glove. Obtain the grip quickly and hide it in your glove. This comes with practice. The mechanics for throwing a curveball and the speed of your arm motions are identical to any other pitch you throw. The difference is in the grip and release. Use your normal wind-up, again no change of arm speed. 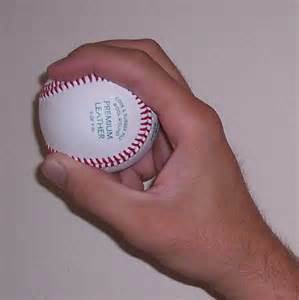 Here is where the curveball begins, with the angle of your hand as the arm moves. Right handed pitcher, your palm should be facing First Base … a left handed pitcher, palm facing Third Base. This of course is redundant, but Follow Through is extremely important as it continues the power and energy created in the windup. After snapping your wrist, the wrist should be facing the batter, continue your follow through until your pitching hand is in front of your opposite hip, and your push off leg comes set. You are now in your proper fielding position. 1. 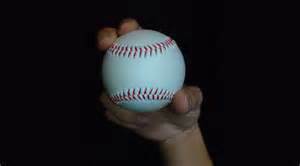 Do not hold the baseball too deep in your hand, touching your palm. 2. Maintain a firm grip … a loose grip fails to create the Top Spin required. 3. Do not cup the wrist inward … wrist stays straight. 4. Focus on location. You want control the curveball as any other pitch. 5. When practicing throwing the curveball, Do Not throw more than 5 to 6 curveballs in a row, as the forearm flexor muscles, become fatigued quickly. (Which can result in injury) Throw 4 or 5 curveballs, then throw 3 or 4 fastballs before returning to the curveball. 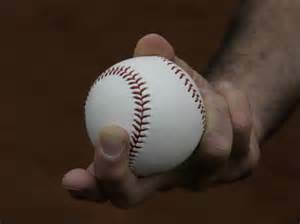 There are several different grips you can use to throw a curveball. Experiment in order to find the one which works best for you.